Are You Done Once Your Loved One Agrees Not to Drive Anymore? You might think that once you made the tough decision to help your loved one transition out of the driver’s seat that your work there was done. 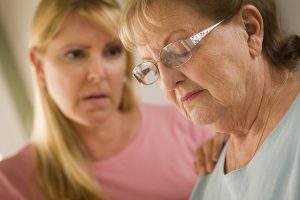 Unfortunately as a family caregiver you sometimes have to revisit topics you thought were addressed. Stay Aware of Sensitive Areas in This Topic. Anything that was a sensitive area for your loved one before she stopped driving is likely to still be kind of a sore spot for her. Keep that in mind so that you can tread lightly when those areas and topics come up. There’s no point rubbing salt in wounds if you don’t have to do so. Make Sure Your Loved One Has Options upon Options. One of the best ways to help your loved one adjust to this situation is to make sure that she never has to worry about how to get somewhere when she needs to. Set up a schedule with other family members to be available on certain days or for certain appointments. You can also hire home care providers who are right there with your loved one during the day or whenever you can’t be there. The more options and backups for those options, the better. Talk to Your Loved One about How She’s Feeling. Make it a point to talk to your loved one occasionally about how not driving makes her feel. If you know that talking about the subject is painful for her, wait until she seems open to talking about the topic. Otherwise, just checking in now and again can help you keep an eye on the situation. Learn the signs of depression and how your loved one expresses depression. Remember to talk to your loved one’s doctor about how she might be responding to no longer driving in case there are other signs to watch for. You may also want to find a therapist or counselor that your loved one is willing to talk to about her change in driving status. You’ve still got plenty of road to cover with your loved one on this issue, even when your loved one realizes that her driving days are done.